Yesterday Tim got to see Doom in action at QuakeCon. It was bloody. It was gory. It was carnage. It looked good. And that’s exactly the reason id Software showed the footage off: to stamp out the fears people seemed to be gathering that the developer was somehow in trouble and that Doom would be a failure. But that footage was a compromise. Id didn’t want to show anything off at all, especially to the public, but something had to be done about the murmurs. QuakeCon was chosen as the isolated showcase point, meaning everyone else must rely on word of mouth until the team feels the game is ready to unveil to the public. But whilst id wasn’t ready to make a formal announcement, Hines was becoming increasingly bothered about doubts slinging their way across the internet about the Doom project and id’s capabilities. He needed to find a way to destroy those rumours, but in a way that wouldn’t have the vast effects of a full announcement. “I really wanted to put something out there that, in a strong way, said, ‘id is working on something that we think is really cool,’” said Hines. 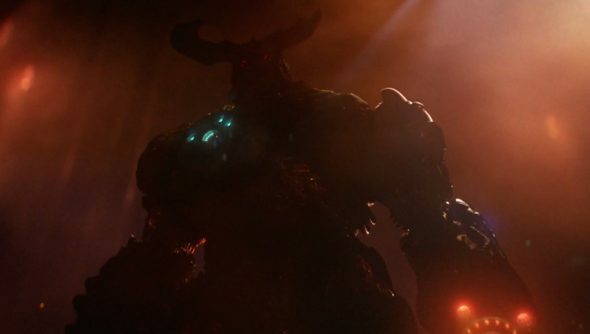 “And we wanted … to show something to [id Software fans] that gives them the confidence that it is still a viable studio that’s doing really cool stuff, that is making a game you want to play, and is treating Doom with the care and respect that you want. It looks like we’ll be waiting quite a few months now for anything further from id Software, with Hines commenting that “Next year is normally when I think we would’ve started.” Unless bootlegged cam footage of the game from QuakeCon turns up on YouTube, it looks exceptionally doubtful that we’ll get a taste of Doom until 2015. Be confident that this isn’t a bad thing though. Tim thought it looked great, and he’s pretty good with these kinds of things.